Have you got a bottled water habit? More and more people are turning from sugary soft drinks or coffee to bottled water as their choice of drink during the day. But just how much are you paying for the bottled water that you drink, how pure is this bottled water, and how harmful are plastic bottles on our fragile environment? Let's look at the math: (one) bottle of your favorite water from vending machine, $1.25 = 20 ounces @ 6.25 cents per ounce. One gallon = 128 ounces. 128 ounces @ 6.25 cents per ounce =$8. In terms of cost per gallon to produce, package, and distribute, the bottled water is more profitable than Big Oil. Do You Know What's in Your Water Bottle? If you drink bottled water, chances are you are already paying $8 a gallon or more for run of the mill tap water disguised as healthy bottled water. Forget the ad images on TV or in print for your favorite bottled water featuring majestic pools of clear, pure spring water running off unpolluted mountains in the background. The fit and healthy model downing that ice cold bottle of (you guessed it) tap water in the ad may not know it, but she's being fooled. And the planet's consumers are being fleeced. If you are like the majority of the planet, you may be under the false belief that drinking bottled water is good for your health. The fact is that most bottled water actually comes from a tap. But since bottled water is big business (estimates are that bottled water sales worldwide top $100 billion annually), the companies that sell bottled water market it as what the public wants - clean, fresh, pure water from a natural source. But because packaged bottled water that doesn't cross state lines to be sold is exempt from FDA oversight, bottled water companies are free to package water from whatever source they choose and sell it to the customer as bottled water. If that's not enough to "make your jaw drop", consider the damage that bottled water does to the environment. The waste produced from bottled water produces up to 10.5 million tons of plastic waste each year. It requires as many as 47 million gallons of oil to produce this plastic waste. And while plastic recycling has begun to catch on around the country, a staggering 80 percent of plastic bottles are simply tossed into the trash to make their slow trip to the landfill. The plastic bottles that do not make it to the trash receptacle end up in the water system, make their way down rivers and stream and into the world's oceans - often forming eddies of trash that can be of great risk to fish, birds, and other delicate wildlife. Plastic takes a long, long, long time to decay. In fact, most of the plastic that has ever been produced in history still exists somewhere in the world right now. That's a lot of plastic waste. More and more folks are discovering that most bottled waters are not only a scam, but that their continued use of bottled water can have devastating tolls on the environment. 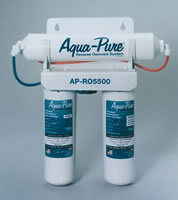 A better alternative for obtaining the healthiest, cleanest water possible is to install a whole house filtration system that can prevent chlorine, chemicals, and other contaminants from ending up in your family's water supply. With a whole house filtration system, not only will you be drinking, cooking, bathing, and doing laundry in the healthiest water possible, you also will be reducing your overall carbon footprint and doing the whole planet a favor. The market has greatly improved for whole house filtration systems, allowing for better pricing that assures that nearly everyone can afford to give their family great, healthy water from every source in the home. And with the money saved by not buying bottled water, the average family can completely pay for the cost of the whole house filtration system in less than two years. 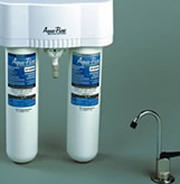 Check out these Popular Items or Shop from The Full Line of Drinking Water Systems for Your Home! Choose from These Favorite Models or Browse The Entire Collection of Filtering Products at Low Prices!